Arrowprop manufactures authentic reproductions of aircraft propellers. These are a beautiful addition to any room, office, den, or living room. Many different propeller models and sizes are available. Dealer inquiries on our decorator propellers are invited. Looking for that custom designed propeller clock for your company? Trying to find just the right propeller clock for the foyer of your bank or office? Wanting more than just a clock to hang on the wall? 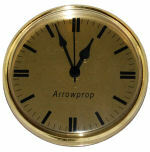 Arrowprop has the clock propeller for you. If you do not see the propeller clock you are looking for, send us an e-mail and we will send you a quote. 46WN 46" 149.00 Beautifully scaled 46 inch propeller in clear finish with Quartz Clock. To order optional world clock or weather station see below. 46WNR 46" 159.00 Beautifully scaled 46 inch propeller with red tips and decals in clear finish with Quartz Clock. To order optional world clock or weather station see below. 52PK 52" 199.00 Laminated hardwood reproduction of the propeller used on the Piper Cub airplane. With a high gloss finish, red tips, Cub decals, and quartz clock. To order optional world clock or weather station see below. 52AKL 52" 239.00 A beautiful reproduction of an early day aircraft propeller like those used on the Piper Cub, Aeronca, Taylorcraft, and other. Constructed of laminated hardwood with clear finish, red tips, and simulated brass tipping on the propeller blades. Comes with a quartz clock. To order optional world clock or weather station see below. Clear Finish 50" 189.00 This 50 inch propeller is a scaled reproduction of the propeller used by Colonel Lindberg on his Spad airplane. Available in clear or beautifully walnut stained finish, with a quartz clock. To order optional world clock or weather station see below. Clear Finish 60" 309.00 This 60 inch Antique Aircraft Propeller like those used on many of the first aircraft ever produced. Beautifully laminated of hardwood lumber with a clear gloss finish or black walnut stained. This propeller is a striking addition to any room. Comes with a quartz clock. To order optional world clock or weather station see below. Clear Finish 66" 314.00 Authentic scaled reproduction of an early day aircraft propeller used on the OX-5 engine. Handcrafted for exquisite detail. Laminated hardwood. Available with clear or walnut finish with a quartz clock. To order optional world clock or weather station see below. Clear Finish 65" 309.00 Scaled reproduction of early day aircraft propeller like those used on the Ryan, Stearman, Fairchild, and many other. Constructed of laminated hardwood. Clear or walnut stain finish with a quartz clock. To order optional world clock or weather station see below. All decorator propellers come standard with either the Quartz Clock or New Clock. The World Time Clock or the Weather Station are available for an additional $30.00. The World Time Clock has a red jet plane that rotates on a disc as the second hand. The clock uses a continuous sweep movement so that the motion of the jet is smooth. Cairo, Halifax, Denver, and Sydney are just some of the cities printed in the outer ring to help keep track of time around the world. The Weather Station combines all three of the popular weather instruments (thermometer, hygrometer, and barometer) in one attractive instrument. This French made weather station is as accurate as it is attractive and features a solid brass diamond cut bezel.